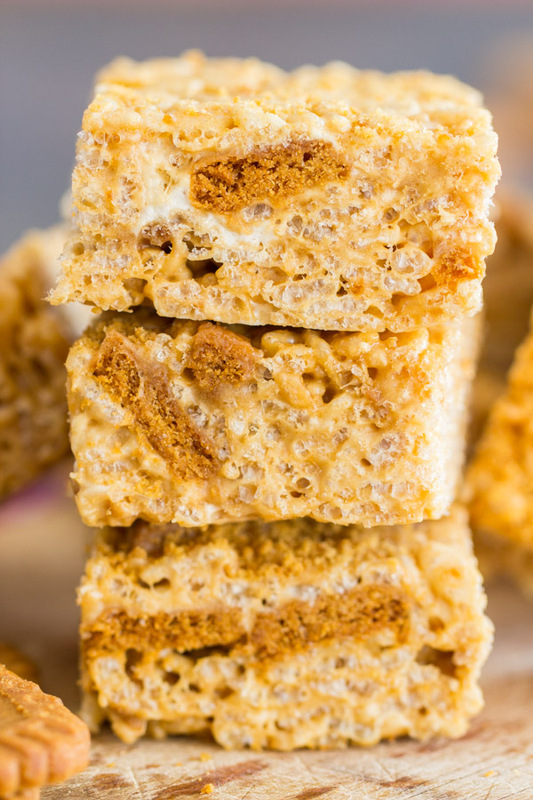 With extra marshmallows for more ooey-gooey goodness, a heaping mound of Biscoff cookie butter, and crunchy, cinnamony bites of Biscoff cookies, there is no way you won’t adore these Cookie Butter Rice Krispie Treats. 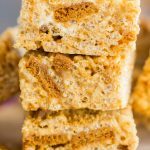 Just as quick & easy as the original version, but these Cookie Butter Rice Krispie Treats are a great upgrade! 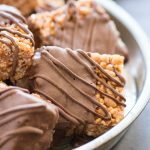 When I made these Peanut Butter Scotcheroos a few weeks ago, I ended up with odd amounts of Rice Krispies cereal and mini marshmallows leftover. 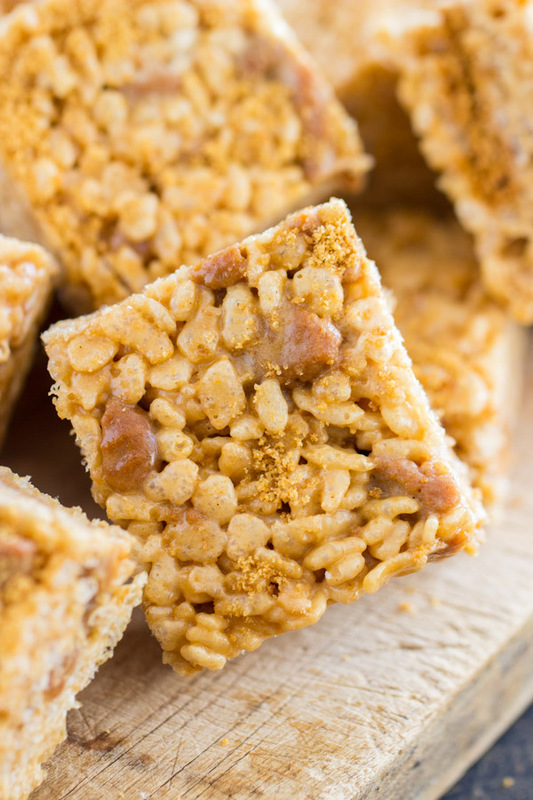 That recipe for Peanut Butter Scotcheroos triggered several other versions of Rice Krispie Treats in order to use up the ingredients! 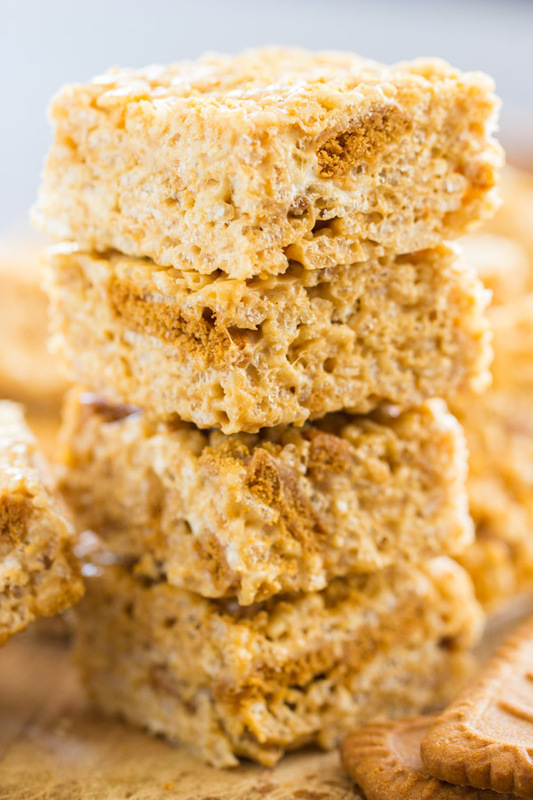 We’ll start with these Cookie Butter Rice Krispie Treats. 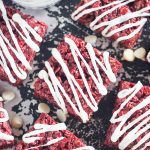 Update: Check out these Red Velvet Rice Krispie Treats, Funfetti Cake Batter Krispie Treats, and Nutella Rice Krispie Treats! I also just felt really inspired. 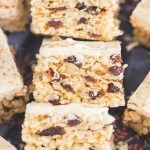 I kept thinking of creative renditions of a Rice Krispies Treat (hereafter ‘RKT’!) that I wanted to try, and they were turning out so beautifully. RKTs are sooooo quick and easy treat to throw together, but if you want to elevate a basic RKT, there’s a million great ways to do it, while still maintaining simplicity. You’re starting with a blank canvas, in a way. They’re an awesome blank canvas, and quite a tasty and sweet base to build upon, but still – we’re just talking about a relatively bland cereal, marshmallows, and a little butter. It begs to be embellished. They really lend themselves well to ‘doctoring up’, and the ideas kept coming. 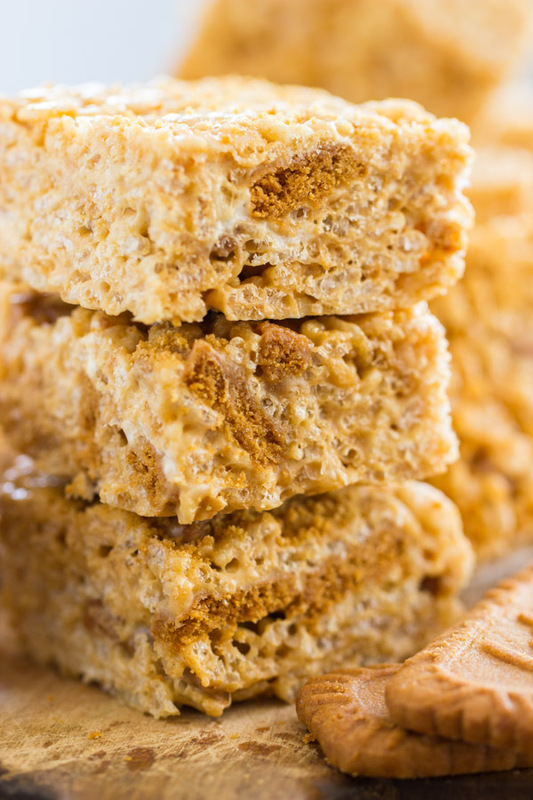 When you sink your teeth into one of these Cookie Butter Rice Krispie Treats, the ooey-gooey factor is off the charts. The extra marshmallow goodness is divine. These are so sweet, sticky, and gooey! The only additional ingredients required for these RKTs are cookie butter and Biscoff cookies. That makes the grand total still only 5 ingredients. And they are no more work or time than a classic RKT. With extra marshmallows, a little extra butter, a heaping mound of melted cookie butter, and crunchy, cinnamony, crushed Biscoff cookies, there is no way you won’t adore these. 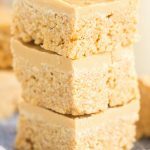 Regular RKTs are so addictive as it is, but these Cookie Butter Rice Krispie Treats are even more a test of will-power! 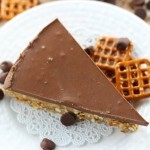 I also have a fabulous cookie butter cheesecake that is quick and no-bake, this Cookie Butter Cheesecake with Biscoff Crust. And this Cookie Butter Frosting recipe is absolutely awesome… it makes appearances in these Cookie Butter Cupcakes, and these Chocolate Cookie Butter Cupcakes! 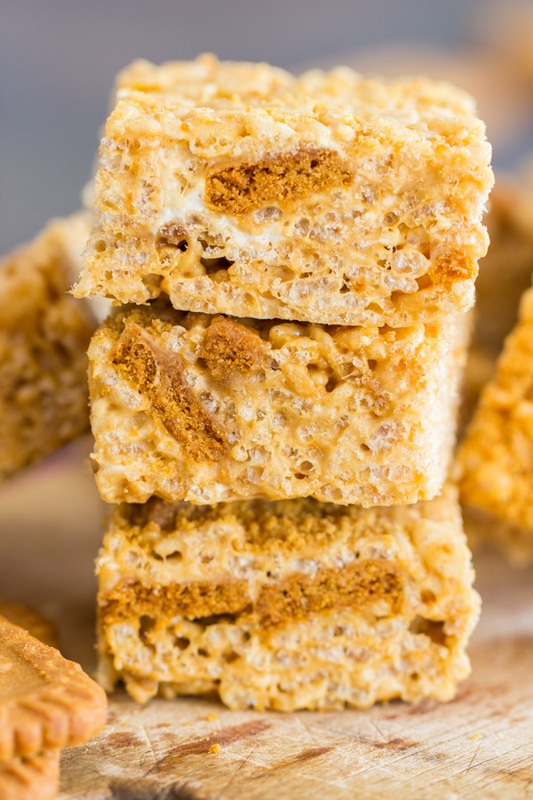 With extra marshmallows for more ooey-gooey goodness, a heaping mound of cookie butter, and crunchy, cinnamony bites of Biscoff cookies, there is no way you won't adore these Cookie Butter Rice Krispie Treats. Just as quick & easy as the original version! 1 1/2 10- oz. bags mini marshmallows 15 oz. In a large stock pot over medium heat, melt the butter. Add the cookie butter, and heat until just melted and smooth. Add the marshmallows, and heat until they are melted and puffy, stirring frequently. Add the Rice Krispies cereal and Biscoff cookies, stirring until combined. Press into the bottom of a lightly greased 13x9-inch pan. Allow to set. Cut into bars. So. Much. yes. 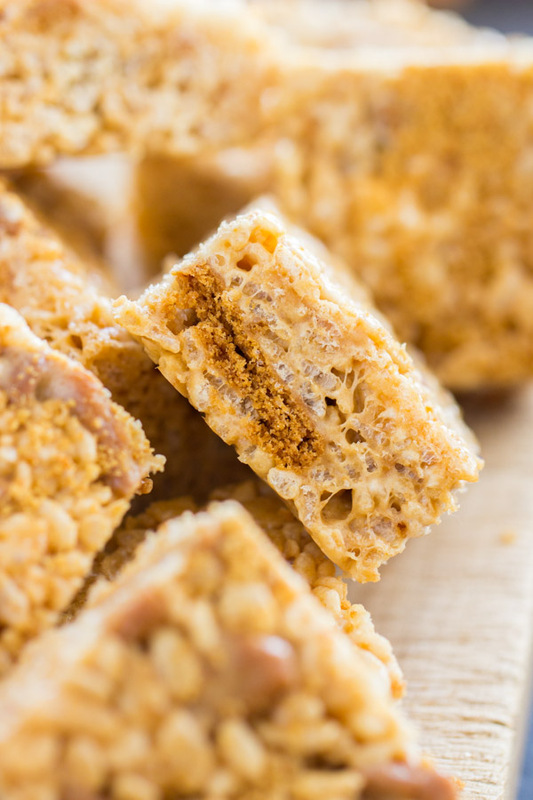 I mean come on, cookie butter and rice krispie treats in one?! How can you go wrong!? Totally drooling over these beauties. I made these again. I’ve made them several times but I wanted a non-egg dessert option for Easter and I know these are superb. I made them thinner than normal and used a bunny cookie cutter. They are cute – not as cute as your beautiful stuff but cute enough. I love this website. The pictures are just mouth-watering and everything I’ve tried turns out delicious. I have the same affinity for peanut butter and white chocolate as you too.